When famed Prussian war theorist Carl von Clausewitz wrote, “All war presupposes human weakness and seeks to exploit it,” he could not have appreciated how prescient his view was with respect to the information battlefield that is the Internet. 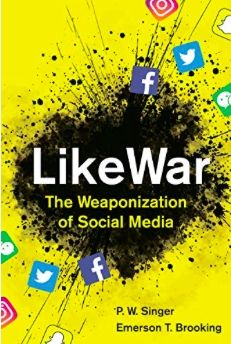 In their book, LikeWar: The Weaponization of Social Media, Peter Singer and Emerson Brooking explore how the weaponization of information, especially through social media platforms, has become a new and devastatingly powerful front that can challenge fundamental tenets of security and yes, even democracy. There is a supercomputer aimed at your brain, and by a significant margin, its goal is to incite anger in order to induce the viral spread of information. “The human brain was never equipped to operate in an information environment that moves at the speed of light,” write Singer and Brooking. The savvy Internet user, whether a nation-state like China or Russia, an insurgency group like ISIS, and any manner of individuals from teenagers to political candidates, has learned to exploit the average user’s eight second attention span and predisposition to believe in the authenticity of anger to cause an emotional contagion that spreads quickly through the Internet with unprecedented consequences. Paired with a faulty human operating system that is particularly vulnerable to manipulation and technology platforms that are not only addictive by design (the average user touches their phone 2,617 times per day) but also reward virality, not veracity, the scope of malfeasance that can take place online is terrifying and endless. Through a series of powerful vignettes, Singer and Brooking unmask how the Internet, which they describe as “the most consequential communications development since the advent of the written word,” is now being co-opted as a “colossal information battlefield”. One of these vignettes fills in crucial, and much neglected, details on Donald Trump’s 2016 Presidential victory. As told by Singer and Brooking, understanding that he had no shot of success through traditional means to political victory, Trump’s campaign executed an aggressive online social media strategy, exploiting an army of trolls, proxies and “shitposters” willing to endlessly produce content aimed at voters’ eight second attention span. The campaign pulled together the most exhaustive database of information on U.S. citizens ever compiled by a candidate, including information culled from Trump’s donor base, the RNC donor base, and as we now know, Cambridge Analytica’s now infamous exploitation of Facebook user activity, which gave the campaign “5,000 data points on 220 million Americans.” With an almost intuitive understanding of the social power of the Internet, the virality of vitriolic content, and armed with unique insights into the minds of voters, Trump’s team used psychometrics to dynamically generate individualized messaging, including by deploying a meme generating hub (did any other candidate even know what a meme was? ), micro-targeting voters, and for the first time, efficiently and effectively reaching an incredibly broad voter base, including isolated patches of rural voters “long neglected because of the cost of television advertising” with exactly the messages they cared about most, based on their social media profiles. “By the end of the campaign, the Trump team had run almost 6 million different versions of online ads. Once, the number of variations on a single message reached 200,000.” Trump used his social media super power (he had more social media followers than all of his GOP rivals combined), amplified by proxies, including but not limited to “a cavalcade of bots and sockpuppet accounts from around the world,” to push out more messages on more platforms to the most people, and in the process captured $5B worth of “free” media coverage (twice that of Clinton), and clinch not only the GOP nomination, but ultimately the Presidency. Through accessible and lucid prose and with intriguing facts and details to support their insights, Singer and Brooking chronicle the collapse of “cyber-utopianism” as criminals, authoritarian regimes and all manner of bad actors learn to coopt the power of this open social communication platform. From China’s desire to control the spirit of their people by banning content that challenges the singular authority of Beijing – in order to realize Mao’s Mass-line vision of “merging the consciousness of 1.4 billion people with the consciousness of the State,” (which apparently requires eradicating Winnie the Pooh from the Chinese Internet because of the characters online association with President Xi) – to Russia’s war of global censorship by means of disinformation, to ISIS’s Information Jihad, each narrative is vividly and factually brought to life as they explore the Dark Side of Internet. In his book, Thank You for Being Late: An Optimist’s Guide to Thriving in the Age of Accelerations, Thomas Friedman writes, “Social media is good for collective sharing, but not always so great for collective building; good for collective destruction, but maybe not so good for collective construction; fantastic for generating a flash mob, but not so good at generating a flash consensus on a party platform or a constitution.” While we may all have an intuitive grasp of Friedman’s belief, Singer and Brooking’s book provides the fact base and the insights to irrefutably support this conclusion. With respect to accountability, Singer and Brooking rightly point a finger directly at technology platforms, especially Google, Facebook and Twitter, noting that the excuses paraded out for not instituting real self-governance fall short when your “service is being used to abet terrorism, stoke racism, and shatter entire political systems.” And, incidentally, you are profiting from it. Cloudflare’s CEO Matthew Prince was the first tech CEO to stand up to the challenge in 2017. Cloudflare is a web hosting service built to protect websites from cyberattacks, shielding dissidents, but also groups like Stormfront, a neo-Nazi forum board. One morning, after the Charlottesville riots, Prince woke up and simply decided ‘enough is enough’ and terminated Stormfront’s use of their network. “My rationale for making this decision was simple,” wrote Prince in an email to his staff, “the people behind the Daily Stormer are assholes and I’d had enough.” This was, according to Singer and Brooking, a “landmark” moment. But the responsibility does not rest singularly with tech companies. The authors offer important insights into how to evolve as a society to be able to confront the dramatic new forces acting on war and politics with recommendations for specific actions that enterprises, governments and individuals can take to collectively reclaim the Internet. The one conclusion that is clear by the end of this work, is that being ignorant of, and worse yet denying, these real threats to our cohesion as a country and to the global community of citizens, is no longer a choice and every individual, every organization, every country has to decide what role they will play in this battlefield and bears responsibility for the ultimate outcome. Reading LikeWar may be, for many, the right first step. This book earns a rating of 3.5 out of 4 trench coats. Read also, Thriller Writer Brad Thor Spills Secrets…. That’s 1.8 times per minute, every minute for 24 hours.